HP has announced a super-affordable tablet called the Slate 7 at Mobile World Congress today. It's 7 inches, runs Android 4.1, and will cost a scant $169 when it hits shelves in the U.S. in April. Here's a link to their landing page, where you can sign up for availability notifications. The display clocks in at 1024 x 600, a 1.6 GHz dual-core Cortex-A9 processor 1 GB of RAM, 8 GB of storage plus a microSD slot. There's a 3 megapixel camera on the back, VGA camera on the front, Beats Audio, and weighs a scant 13 oz. Hit the jump for the full press release! What do you guys think? Anyone remotely surprised to see HP getting out of the webOS game? Does this baby stand a chance of swinging with the Nexus 7 in the world of affordable Android tablets? Leave a comment to pay your consolations to our beloved Derek Kessler. BARCELONA, Spain, Feb. 24, 2013 — HP today announced the HP Slate7, an affordable Android Jelly Bean consumer tablet that provides customers with easy access to Google Mobile services. With a 7-inch diagonal screen and weighing 13 ounces, the HP Slate7 is an ideal trusted personal companion, featuring a stainless-steel frame and soft black paint in gray or red on the back. It also is the industry's first tablet to offer embedded Beats Audio, for the best-sounding, richest audio experience available on a tablet. "To address the growing interest in tablets among consumers and businesses alike, HP will offer a range of form factors and leverage an array of operating systems," said Alberto Torres, senior vice president, Mobility Global Business Unit, HP. "Our new HP Slate7 on Android represents a compelling entry point for consumer tablets, while our ground-breaking, business-ready HP ElitePad on Windows® 8 is ideal for enterprises and governments. Both deliver the service and support people expect from HP." The HP Slate7 joins the recently introduced HP Chromebook as part of HP's push to offer access to the Google experience. HP's tablet offerings reside in the company's newly formed Mobility Global Business Unit, established in September 2012 with the hiring of Torres. Torres joined HP from Nokia, where he was executive vice president and oversaw the MeeGo products and platform. 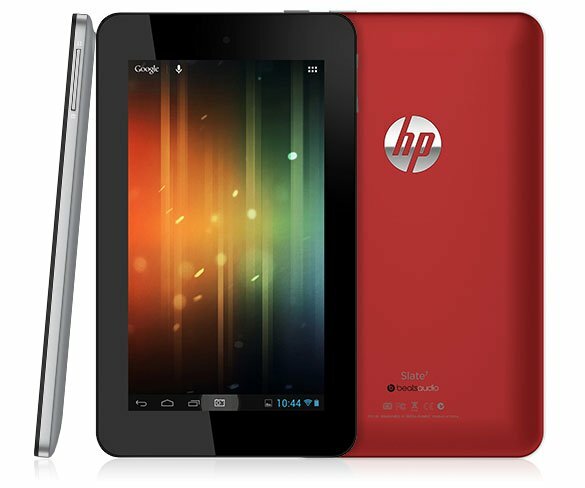 Powered by an ARM Dual Core Cortex-A9 1.6 GHz processor, the HP Slate7 is fast and responsive. Integrated wireless allows customers to access email, the internet and key applications, while the High-aperture-ratio Field Fringe Switching (HFFS) panel offers wide viewing angles that provide easy viewing of documents, games, photos and videos—even in outdoor lighting conditions. The HP Slate7 includes a 3-megapixel camera on the back and a VGA camera on the front for chatting, videos and photos. With the HP ePrint (2) application, customers can easily print while at home or on the go, and the exclusive native printing capability enables customers to print directly from most applications. A micro USB port allows customers to easily transfer files, and a suite of applications from HP spans exclusive games to productivity tools. The HP Slate7 is expected to be available in the United States in April with a starting price of $169. Additional information about the HP Slate7 is available at www.hp.com/slate and The Next Bench.